This album is probably the most unpolished record I've heard in a while on bandcamp. Being recorded in an artists 'messy bedroom' will do that I suppose. 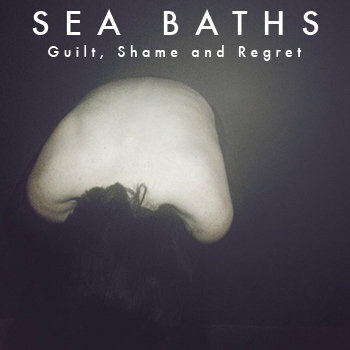 And yet, despite its rough around the edges sound, I find myself really enjoying Guilt, Shame and Regret, an EP by Sea Baths. It's got its ear quite clearly turned to early 80's post-punk. The lack of polish gives each track a certain gloomy atmosphere, guitars being plucked, and reverberating in a large, empty space, and what electronics and synths are utilized only add to that feeling of emptiness. Honestly, what drew me to this record is the guitar work. That isn't to say Guilt is filed with mind blowing riffs or complex time signatures, no, it's the sparseness, the simplicity that I liked about them. The absence of any discernible bass is readily and immediately apparent, so the rhythm section is a bit under powered on the low end, but the drum and guitars work well as a duo. A melancholy duo, with the drums supplementing the guitars, keeping time, but nothing more. The lyrics are rather hard to understand – both because singer (and bedroom producing Bath-er) Sebastian Mercado's voice is shrouded in atmospheric echo and because his delivery sounds like warbling from time to time. Not on a Dylan level of completely unrecognizable, but still not easy parse out and probably the worst aspect of an album that already wears its lo-fi on its sleeve. Heck, its entire sleeve is made of lo-fi. Still, I can't turn the album away for having kinda crummy singing. On a technical level bad, but it really does fit in with the rest of the album atmospherically. I can't turn an entire album away for one flaw (not even halfheartedly), and I don't think anyone reading this review should either.